Chad Miller, associate professor of horticulture, and Braden Hoch, master’s degree student, both in the horticulture and natural resources department, recently traveled to Purdue University to attend the annual North American Colleges and Teachers of Agriculture, or NACTA, conference. Hoch is working with Miller and Jason Griffin, a professor in the horticulture and natural resources department. Hoch presented a poster on behalf of fellow graduate student teaching assistant, Stuart Sprague, "Grocery Shopping for Geophytes." This project is a part of the Plant Propagation course in which the two are teaching assistants. Miller gave an oral presentation, "Plant Madness in Plant Identification," based on an activity implemented in his Landscape Plants II course. 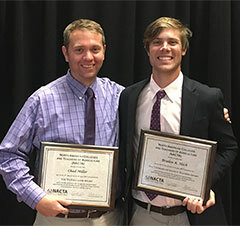 At the conference, Hoch received a NACTA Graduate Student Teaching Award. The award is given to graduate students who are active in classroom instruction and demonstrate excellence as teaching assistants in agriculture disciplines. Applicants are reviewed by a committee of NACTA members and are evaluated based on the graduate student's teaching philosophy, involvement in teaching outside the classroom, self-evaluation, support letters from supervising faculty, administrator and student recommendations. Miller received a NACTA Educator Award at the conference. A major focus and intent of the North American Colleges and Teachers of Agriculture organization is to recognize individuals whose efforts represent the very best in agricultural higher education. The award is a criterion-based award, reviewed by a committee that evaluates the nominee based on criteria such as teaching philosophy, student evaluation summary, nominee's teaching activities and supporting letters from peers and administrator.